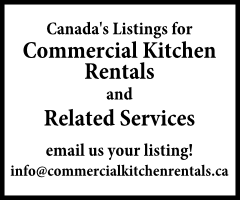 Commercial Kitchen Rental Listings for Canada. by the hour. Free parking. $30 to $35 per hour depending on usage. Discounts available for 3 and 6 months leases. Small business mentoring services available. Victoria Park and Eglinton Ave. E.
$22/hour between 8am and 8pm, $16/hour from 8pm to 8am. For those inquiring, please note that this is a vegan and gluten-free only kitchen. Not suitable for baking or cooking large volumes. Hourly rates: $15+/hour, Flat monthly rates available, Free parking, Dry storage available. $50 per hour, 24 hours. tguillot@standrewstoronto.org.com Rates for Regular Business Hours:$50/hour regular $35 per hour non-profit.